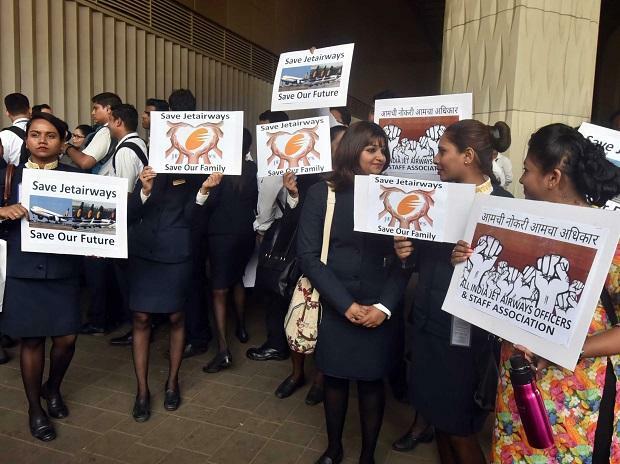 More than 400 members of the Jet Airways ground staff on Friday marched to the head office while anxious customers queued outside the airline’s ticket counter at Mumbai airport, seeking refunds for cancelled flights. Jet extended its international flight cancellations till Monday and operated only nine planes on domestic routes on Friday. In Mumbai the airline used to have more than 140 daily departures and on Friday there were only two take-offs because the airline is left with little money for operations. “There is no clarity on what is going on in the airline. Should we stay longer or look for another job,” asked Vikas Vishwakarma, a ground staff member as he marched with his colleagues. While the airline has defaulted on salaries to pilots, engineers and the senior management for three months, it failed to pay its ground staff salaries for March. “How long can we sustain like this? Employees have to pay their EMIs and take care of their families,” said another employee. While rival airlines were offering opportunities, salaries there were lower. The march was led by trade union leader and Nationalist Congress Party leader Kiran Pawaskar, who used the opportunity to target Prime Minister Narendra Modi and the airline's former chairman, Naresh Goyal. “The Prime Minister promised two crore (20 million) jobs, which he did not deliver. 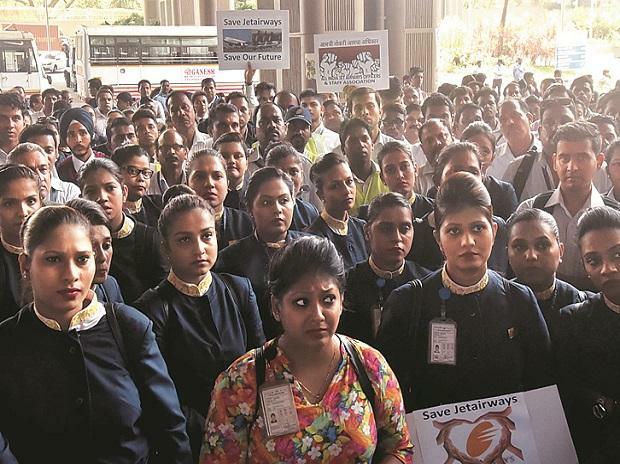 What is the government doing to save 16,000 jobs in Jet Airways,” Pawaskar remarked in a microphone address to employees at airline headquarters. “We do not want to shut down the airline. All we are seeking are salaries for the staff. The airline's slots and route need to be protected. What will be left if there are no routes to operate?” he said. The All India Jet Airways Officers & Staff Association, led by Pawaskar, filed a police complaint against Goyal; the airline's chief executive officer, Vinay Dube; and State Bank of India officials for alleged cheating and criminal breach of trust. Meanwhile, harried passengers continued to line up at the airline’s office, seeking refunds. Some angry passengers on Thursday night roughed up the reservation counter staff on learning of last-minute cancellations. “My relative was booked on the flight from Bhuj to London via Mumbai. First the Bhuj-Mumbai flight was cancelled. We were offered the Ahmedabad-Mumbai flight, which too was cancelled, and now the London flight too is cancelled. We had to book tickets to Mumbai on other airline, pay extra for the luggage and spend on petrol to drive to Ahmedabad. This is not expected from a reputed airline like Jet,” said Ahmedabad resident Mayur Thesiya.